Finding the best backpacks for traveling Europe can be a daunting task, right? A travel backpack might be the biggest investment you make in your Eurotrip apart from your plane tickets. And it’s something you’ll use all the time (they don’t call it “backpacking Europe” for nothing)! So I’m here to help you sort through the many travel backpack options out there and to help you quickly and efficiently find your best backpack for traveling Europe. Don’t have time to read this full guide and just want to grab a quality bag asap? So who am I and why should you trust my travel backpack recommendations? I’m Nate, a full time traveler since 2016. I quite literally live out of a backpack and a daypack. I’ve traveled in Europe a LOT. I’ve been there more times than I can count, often for months at a time, and so far I have visited over 31 countries on the European continent (with more to come in the summer of 2019). And guess what? I’ve taken backpacks with me the whole time. I know that a quality travel backpack can be your best friend while traveling through Europe. 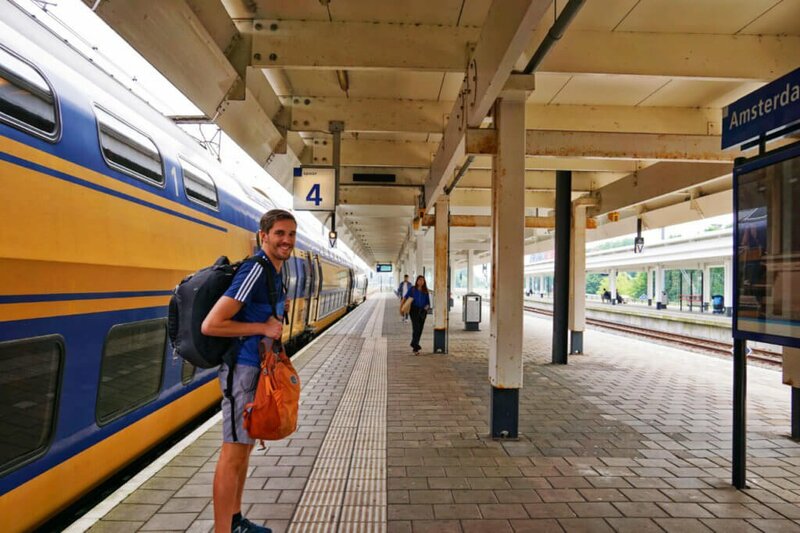 4 great travel backpacks for Europe – anywhere else! My personal favorite bag + daypack combo that I’ve taken to over 50 countries. Oh, and if you’re curious, you can also read the full list of what I pack to travel the world here! 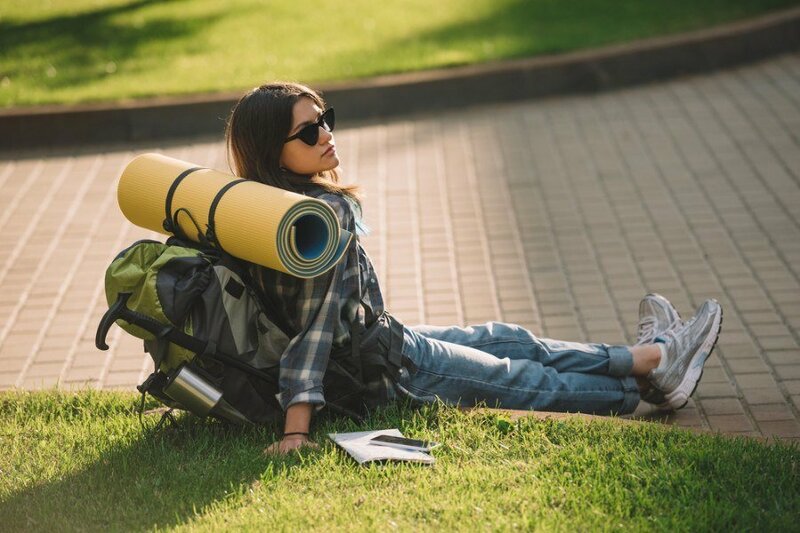 Let’s start by covering some of the basic things you should be looking for when shopping for a backpack for traveling in Europe. Most importantly, you need to decide how much luggage space you need in your travel backpack. Personally, I suggest aiming to be as lean possible – you’ll be carrying this thing a lot, so the less weight you have on it, the better. Carry-on sized bags help save money on checked bag fees (especially on European budget airlines like Ryan Air). Smaller bags are easier to stuff into the overhead compartments on trains, or into the sometimes small lockers in hostels. You don’t want to be that backpacker who has a huge bag hogging up the corner of the crowded dorm room! And I know what you’re thinking: but what about laundry? 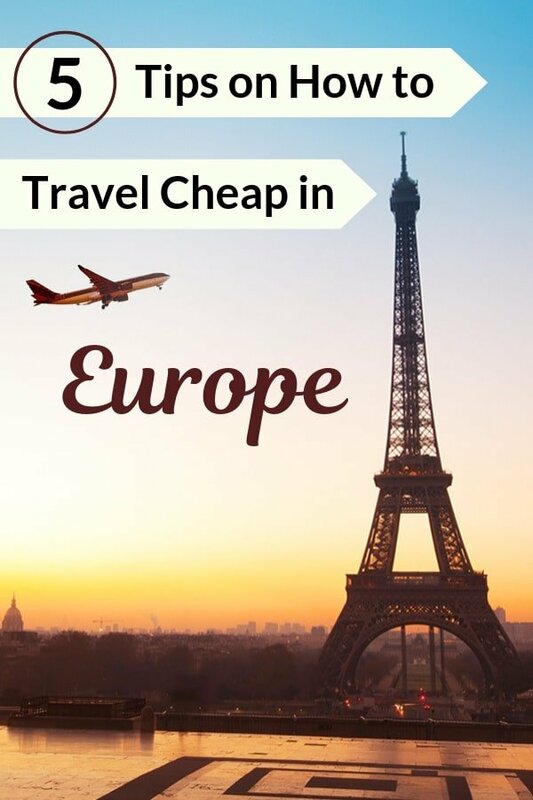 Well, fortunately, that’s easy and cheap to find when traveling Europe. Most hostels offer a laundry room or laundry service and, when they don’t, it’s usually just a few blocks away. So leave the extra outfits at home and just plan to do a wash every now and then! The backpack in the photo of me above in Amsterdam above is a 46 liter bag, which I use as my main bag now and which is about the maximum size you can have before you start to have to check your bag. Keep in mind when looking at that photo that I’m very tall, so it may look bigger on you. You’re going to be walking around with this bag on your shoulders a fair amount, so finding a bag that comfortably fits your frame is important. One thing that REALLY helps distribute the weight of a heavy backpack is a hip-strap. If you’ve not used one before, it can feel a bit funky the first time, but it works wonders by moving a lot of the weight from your shoulders to your hips. Trust me, your shoulders will thank you at the end of the day for using the waist-strap! On the other hand, backpacking Europe isn’t the same as trekking through Nepal or Patagonia. Honestly, you will seldom carry your travel backpack more than a kilometer or so at a time, so it’s not like you need to bother getting an expensive and bulky hiking backpack (which often have way more features in terms of padding). I’ve seen so many backpackers in hostels with tears in their bags, ripped straps, or just generally discolored and gross looking backpacks. Backpacks take a beating and it’s important to buy a brand that gets good reviews over the long haul. So even if you are trying to travel cheaply in Europe, you’ll save money by buying a backpack that lasts longer. Traditional hiking backpacks have a ton of pockets, as well as the main compartment that is usually accessible only from the top. Some people like this because it helps them to organize – they designate a pocket or compartment for toiletries, another for shirts and underwear, another for pants, etc. Personally, I think a lot of compartments and pockets are constraining, and I find that having fewer, larger pockets is more versatile. Also, note that some backpacks also come with an option for a built-in waterproof cover. While a nice feature, I personally don’t think this is necessary if you just need a backpack for traveling in Europe. Sure, it rains, but you’ll be inside most of the time (again, this isn’t Patagonia) and it’s almost always possible to quickly find cover in Europe. Whatever you do, don’t overthink small features like pockets. The truth is that you’ll find a way to pack your stuff in most bags, so it’s size, comfort, and durability you should be focusing on when picking your backpack. 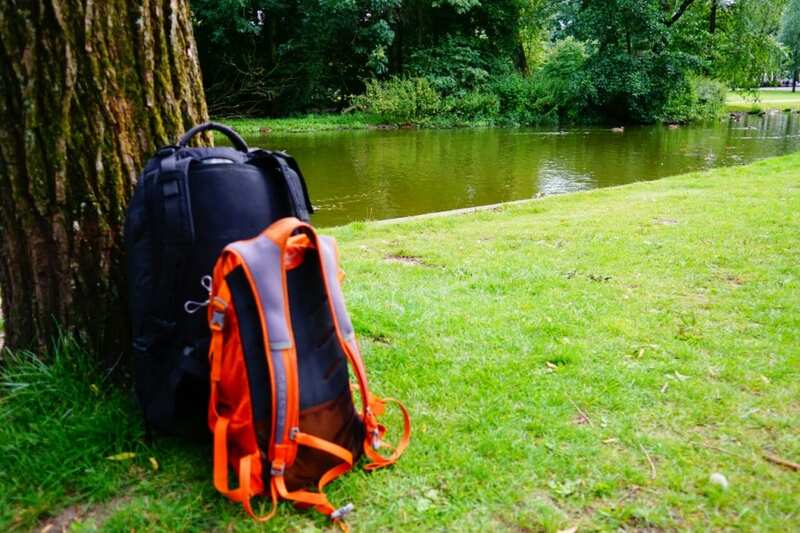 So with that in mind, here’s a rundown of some of the best backpacks for traveling Europe, starting with my personal favorite and the backpack I’ve used for my last four big trips through Europe. The Osprey 46 L Porter is the most up to date version of the backpack I’ve used for the past several years (if you want a more detailed take on it, check out my full Osprey Porter 46 review here). I love it because it’s relatively affordable, it’s the perfect size for backpacking around Europe, it has a waistband for easier carrying, and it only has one large compartment that is accessible from the front, not from the top. It also has some nifty compression straps that help to keep your profile small. Plus, I happen to think it looks pretty stylish (I have the black version) compared to other backpacks that scream “I’m a scruffy backpacker who hasn’t showered in days” to everyone you meet. One other really cool feature about this bag is that it converts from a backpack into a duffel bag by folding the straps into a compartment in the back. This is great for protecting your bag if you have to check it while flying, or for leaving it in hostel luggage rooms or other places where the straps tend to get easily caught on things. Lastly, I love Osprey because they have a lifetime guarantee – they will repair any bag they’ve ever made for any reason! If you need a little more space, the Berghaus Trailhead 65 L Rucksack is a highly rated, very affordable option. It has an excellent strap and harness system, which distributed the weight of the pack well across your body. If you’re planning on doing lots of walking with your bag, or just generally carrying around a lot, this is about as comfortable as you’re going to get at this price range. Plus, this backpack comes with several compartments, pockets, and the like, which makes organizing your stuff easier (so you don’t have to fumble around in those dark hostel dorm rooms!). Need a little bit more space, but not too much? Then I suggest upgrading to the Osprey Fairpoint 55. It has almost 10 liters of extra space to fit in those extra shoes, clothes, or whatever else it is that you need, plus a good hip and harness system to allow you to comfortably carry that extra weight. Also, if you need even more space (though again, I think this is too much for most people), there is a 70 liter version. This is also definitely one of the most popular backpacks for traveling Europe. So if you want a safe bet that many others seem to like, this is a good choice. I’ve seen this exact backpack many times in hostels all over the European continent! So obviously a lot of other people think it’s one of the best backpacks for traveling Europe. Just be sure to tag yours so it doesn’t get taken by the wrong person! If budget is important to you, check out this might be your best backpack for traveling Europe. It’s unique but is only about a third of the cost of the other options mentioned here. Again, my advice is that’s ideal to spend a bit of money on a quality backpack, but if you just don’t have that much dough, the Witzman Travel Backpack is the best reviewed of the budget backpack options. It’s super rugged and also more stylish than the other options here. In fact, it’s so stylish I now kinda want to try taking some Instagram photos with it on! The main issue with this bag is that it’s really more of a duffel or rucksack that converts to a backpack as opposed to a true backpack. That may be fine for traveling Europe, where you don’t really need to have a bag on your back as much as other places. Most backpackers in Europe carry a daypack in addition to their main backpack. This makes a lot of sense since a lot of times you’ll need something to carry your camera and other essential items while you are out exploring for the day. It also gives you extra space to pack things if you are trying to carry on a plane (since daypacks can fit under the seat in front of you, and usually count as a personal item). There is only one daypack that I feel comfortable recommending at the moment: The Osprey Daylite Daypack. At 13 liters, it’s the perfect size for packing your camera and other items (I even fit my drone in there!). It’s lightweight so it doesn’t hurt my back, and it has a small hip strap that can be useful at times. It’s also very water resistant and has a little pocket in the back where I can slip my laptop or a book. Best of all, it straps into my main Osprey backpack through their proprietary locking system, meaning it’s possible to attach the two bags together and just carry them as one! Oh, and again – in case you couldn’t tell that I love Osprey by now – it comes with their incredible lifetime guarantee. That’s it for this guide on the best travel backpacks for Europe! Do you have an opinion on the best travel backpacks for Europe? I’d love to hear your thoughts in the comments! And if you have any questions or need further help to choose your best backpack for travel in Europe, just let me know! I’m always here to help my readers. Lastly, if you’re headed to Europe, you might also be interested in reading my article about how to find the best time to travel in Europe. I might have missed this but where do you put your laptop? Do you put it in your 46 L bag? No, just inside the daypack! I only travel with my ASUS flipbook usually. Sometimes (like when I was in Mexico), I managed to also fit a full on laptop in there. It’s bigger than it looks!